If you're like me, you are still in the Irish spirit of St. Patrick's Day. I did a wee bit of celebrating on Thursday with a couple pints of Black Cat Stout and a fine corned beef sandwich at the Northampton Brewery in Northampton, Massachusetts (there was also great live Irish music). It was a good time but my real St. Paddy's Day party will be tonight at The Irish Times in Saratoga, New York. 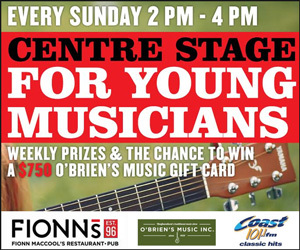 Friends and family are coming later today and we'll be heading out for some Irish fare, a few pints and hopefully a jig or two while listening to the band. I think I might try their potato and leek Soup, a classic Irish dish, and see how it compares to the batch I made last weekend. Some potato and leek soup recipes are cream based, meaning they contain a fair amount of dairy (either milk or cream) however I make my potato-leek soup mostly with chicken stock, using only a small amount of milk at the end to round out the soup and give it nice body. I find the potatoes do a great job on their own of making the soup "creamy" and you can really taste the leeks and potatoes without too much cream. 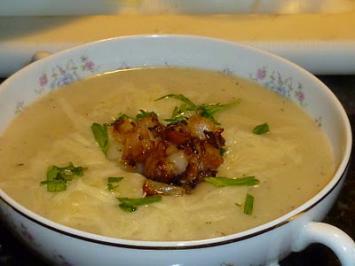 To give my soup an extra flavour burst I topped it with some sauteed diced potatoes and onion, in addition to a little cheese. Since we were having a fancy dinner last weekend I used Gorgonzola cheese to finish off the soup and it was amazing. The cheese offered a little saltiness and tartness, in addition to a great texture contrast, as did the crispy diced potato and onion. This is a very simple recipe and I hope you give it a try. Since there is a fair amount of knife work involved, you'll want to have your leeks and onion prepped before heating up your oil and butter. To get your leeks ready you'll have to clean the inside of them very well as they often have sand in them. To start, trim off the root end and then cut off the dark green tops. I usually make my cut just where the colour turns to dark green. Next, run your knife down the length of the leek, cutting it in half lengthwise. To clean them you can simply run the cut side of the leek under running water, opening up the layers of leek to wash away any grit or sand. With a sharp knife slice the halved leeks into thin slices. Now, in your favourite soup pot add the butter and oil and heat it over a medium heat. Add the leeks and stir to coat with the oil and butter. Stir every couple of minutes as they cook and you prep the remaining ingredients. While the leeks saute, prep your onion (rough chop) and add it to the leeks. Next smash and chop the garlic and add it. Season the mixture with a little salt and pepper (not too much as it's best to continually season as you cook). Peel the potatoes and half them. With the cut side down on the board slice the potatoes as thin as you can (think half moon shaped potato chips). Don't rinse the potatoes as the starch will help thicken the soup. Add the potatoes to the pot, along with the dried savoury, and stir the mixture well. Next add the chicken stock. This should be enough to just cover the leek and potato mixture. Bring the pot to a simmer and let cook until the potatoes are tender and have broken down. This usually takes about 30-45 minutes, thus giving you a nice break in the action. At this stage you can set the soup aside for hours or overnight in the fridge and finish it later. After the soup has broken down and become tender it's time to blend. While this can be done in batches in a blender I recommend using an immersion blender as it is a lot easier. Blend the soup until it is smooth and add the whole milk. Taste for salt and pepper and add the freshly chopped thyme. Season with salt and pepper to taste. Simmer the soup for about 10-20 minutes on a very low heat until ready to serve. For the garnish, heat the oil in a non-stick saute pan and add the finely diced potatoes. Cook on medium heat until they start to become tender and then add the minced onion and butter. Season with salt and pepper and cook until crisp and golden brown. 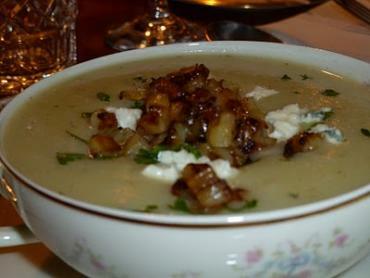 Pour the soup into bowls and garnish with cheese (cheddar or Gorgonzola) and then add a spoonful of the fried potatoes and onion. Serve with some crusty bread and enjoy! We rolled out of bed yesterday morning with the intention of going for a leisurely run along the waterfront, which turned into a 6 km run/walk to beautiful Mission Bay, a suburb just outside of the Auckland CBD. We soaked in all the sights and sounds along the way as the warm sunshine beat down upon our sweaty faces. We couldn't have chosen a better day for one of our epic strolls. Looks like the Kiwis felt the same way, as the ocean was sprinkled with people happily swimming, splashing and paddle boarding in the sun. 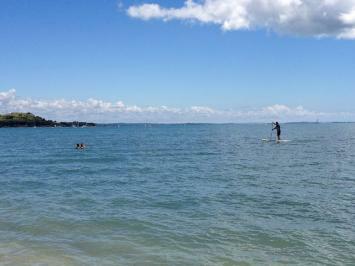 When we came upon lovely Mission Bay Beach, it suddenly dawned on me that I had not yet dipped my toes in the Pacific. So, quickly stripping off my sneakers and socks, I ran for the water and once again, found myself surprised at how warm it was. After all, even on the hottest summer day in Newfoundland, the ocean is still cold enough to freeze to death (God love thee North Atlantic!). Afterwards, it was on to BurgerFuel, a gourmet burger joint, proudly NZ owned, and while it's a little pricier than your usual run of the mill burger place, it is worth every penny. I think those burgers are one of the things I'll miss the most about this place when I finally return to my home sweet home. And those kumara fries... Mmmmmm. Kumara is a local variety of sweet potato that, in French fry form, is delicious. At BurgerFuel, they serve them up with a dollop of their famous aioli (garlic mayo) sauce - a mouthwatering combo that would please the pickiest of palettes. Our delicious dinner at BurgerFuel - boy will we miss this place. Later that evening, we tossed around the idea of heading back to Mission Bay on Wednesday to play in the sand and sun, but ended up spending the day preparing for our upcoming trip on the Stray Bus. Check out the awesome clothesline we strung up in our room at the hostel  Newfoundland-style! It was most definitely a good day on clothes. Stay tuned folks, plenty more adventures to come! About me...Linda Browne I recently quit my job as staff writer at Downhome, boxed up all of my belongings, sold the car and moved out of my apartment - all to hang out in New Zealand for a while. Will it all be worth it? Keep reading to find out! Fri. January 14, 2011 And...WHAMO! How was that for a dump a snow! Nothing like the good old Newfoundland weather - unpredictable, unreliable and always inconsistent! It was only days ago I saw two joggers wearing shorts, puttering down the parkway and now...40 cm of snow...boom! 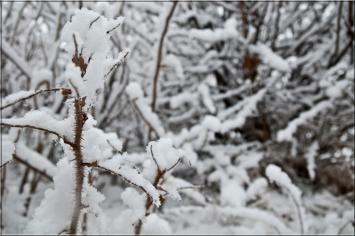 Hello winter! Needless to say, if you were driving around the city of St. Johns last week you were slipping and sliding. If your route involved one of the city's more treacherous hills, forget it. You werent making it up that puppy! Its always entertaining to watch drivers during the first major snowfall of the year. People thinking theyre able to drive as they normally would in summer - till you see them fish tailing down an incline. The drivers lips are moving and you know their words are of a colourful nature! At our house, the snow was a welcome site. The kids were dressed and scooted out the door for some long overdue fresh air. I was going to spark up the snow blower and clean up the snow-filled driveway. Its a great sense of accomplishment pulling the rip cord to hear the roaring of the engine! The snow blower purrs like a kitten and this Mama is off to the races. Wintery bliss! The kids frolic in fluffy snow laughing, having fun and for now...getting along. I steam ahead, clearing the driveway, proud of myself. Still, as the saying goes, all good things must come to an end! GrrEEEeek! BANG! Thump! Sweet mother! What was that?" Machine off, and with a quick prayer before I look, I see that...oh my. A large rock has made its way into the snow blower. I remove it and proceed to continue on. (Foolish me). We were moving forward, but no snow was spitting out. Dry as a bone. Another look reveals the augers are not rotating. Why? I have no clue. As far as Im concerned, rock gone = machine works again. But, no. Ive heard of a shear pin? A belt? I have no idea. I do know however, that this is not good. Only ten minutes into snow clearing 40 cm of snow and we were brought to an abrupt halt. The irony? My husband's truck sits lifeless in the driveway with snow plow attached. But there are two problems: No. 1: Hes out of the country and No. 2: I havent a sweet clue how to use it. I scowl at the truck, for now its a useless ornament mocking me and my predicament. Then I glare at my broken snow blower conceiting defeat! As if holding the sacred white flag, I pitifully sniff, waving my hand in the air. Help! My neighbours (and friends) make their way, snow blower in tow. With joined forces we clear the white glue from the pavement and walkways. Cars are returned to their initial parking positions and all consider it a job well done. Then, like any good snow-clearing event, we head upstreet, barbecue some hot dogs and hamburgers, open a bottle (or two) of wine, serve up a few Caesars and...four hours later...hope for a snow day! Nothing like a good snow party to wipe away what ails ya! After all, might as well find a way to enjoy the shovelling and plowing - chances are the snow's here till June! Read more here: http://mommyjingles.blogspot.com/ About Me...Mommy Jingles I have a wonderful husband, three adorable children, drive a mini-van (what else are we all fitting into), love a good chick-flick and live on an awesome street. I am not a morning person nor will I ever be. I love being a night owl, yet strongly regret it in the morning when the pitter-patter of little feet stampede through the hall. Repeatedly! The fact my kids make it to school on time still amazes me. Hence, an outlet, refuge and sanctuary had to be found...Mommy Jingles is born. Thoughts, rantings, trials and successes from a mother, wife, friend, and an occasionally "I'm gonna loose it" woman! Wednesday, July 18, 2011 I am currently cruising at a speed of 416 m.p.h. at an altitude of 41,042 ft. High above the clouds I once believed were filled with Care Bears, I journey to the windy city of Chicago, IL. This is my third journey of the year, having already completed two hockey trips in the last six weeks. My husband and I are off to a seminar, leaving our little ones back home with their grandparents (potential disaster - in the back of my head I'm thinking this may be the last trip the hubby and I take alone). There was a time when climbing aboard a Boeing 737, travelling abroad toward endless possibilities, brought feelings of joy and excitement. Having attended school in the U.S., I travelled the skies with bliss. Just last August we embarked on our first family vacation to Pennsylvania. 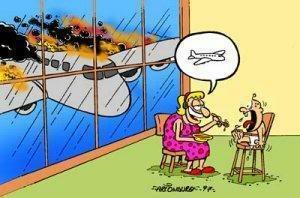 Then, with the help of some turbulence (more like our plane bouncing around like a ping-pong ball), I became helpless. My mind rattled, my stomach turned, all the while my little darlings coloured and played games oblivious to the consequences if the plane went down. "Smile and look happy," I told myself over and over (as I hid my white knuckles from view). From here onward, flying bliss has been replaced with nausea, stomach pains and hot flashes. A means to end. Vacation. A metal tube the size of a two story building, hurdled into the air...ugh. I watch the flight attendants and remind myself that they, like the pilot, do this everyday. Shuttling travellers through the blue, sun-filled skies, serving Bits & Bites along with over-priced sandwiches. They, however, saunter down the aisle with comfort and grace while I hold on for dear life just to make it to the lavatory. Curses on them! I pay for my ticket, get squished into the middle seat next to Phil and another gentleman (who appears to be enjoying this experience as much as I), without so much as complimentary vodka cranberry to calm my nerves. Jingles by'! Which brings me here. Blogging. Writing the thoughts and rambling tidbits to those who may or may not ever read this. Toronto in t-minus one hour and 20 minutes. Chicago...not quick enough. Pee break...immediately! Read more here: http://mommyjingles.blogspot.com/ About Me...Mommy Jingles I have a wonderful husband, three adorable children, drive a mini-van (what else are we all fitting into), love a good chick-flick and live on an awesome street. I am not a morning person nor will I ever be. I love being a night owl, yet strongly regret it in the morning when the pitter-patter of little feet stampede through the hall. Repeatedly! The fact my kids make it to school on time still amazes me. Hence, an outlet, refuge and sanctuary had to be found...Mommy Jingles is born. Thoughts, rantings, trials and successes from a mother, wife, friend, and an occasionally "I'm gonna loose it" woman! Mon. Dec. 6, 2010 It's time to get crackin'. Today was another one of those hectic work days. By the time I got home from work, walked the dog, ran some errands and did some chores, it was after 8, and I had yet to eat supper. On days like this I often turn to one of my favourite foods to bail me out, without compromising taste and nourishment...eggs. I love breakfast and brunch and unlike some people I have no issue with eating breakfast for supper/dinner. I've always been that way. I always thought it was a real treat when occasionally as a kid Mom would make eggs, fried bologna, hash browns, toast for supper, orange juice and all. That's still one of my favourite suppers. Needless to say I am also a fan of the diners and restaurants that serve an all-day breakfast. So, back to my habit of weekday supper and eggs. With the voice of James Barber (The Urban Peasant) in the back of my head telling me to use what I have on hand and be creative with ingredients, I always seem to be able to pull together a satisfying supper. By using a combination of what I have in the fridge, whether it be bell peppers, hot peppers, mushrooms, onions, sweet potato, potatoes, garlic, herbs, cheeses, bacon or sausage, I am always able to make something unique and tasty without too much time or hassle. Sometimes I incorporate the eggs and the other ingredients together to make omelets or frittatas (and my favourite...the skinny frittata), while other times I make a hash out of potato and veggies (with or without meat) and top it with fried or poached eggs. When I'm extra hungry and in need of some extra carbs I have a slice or two of toast with jam to go along side. 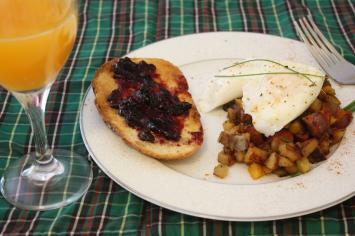 You can't beat toast and strawberry-rhubarb or partridgeberry jam with savoury hash and eggs. As you can see in the photos I like to have my eggs in a variety of ways. Over the coming weeks I plan to submit recipes for some of the specific combinations I have created. I have potato and bell pepper hash with chorico sausage and poached eggs, sweet potato hash with bacon, a Mexican skinny frittata with salsa and hot sauce, a linguica sausage, potato and onion hash with fried eggs, and the list goes on. Stay tuned. In the meantime, the next evening you get home from work and are short on time and energy, give breatfast a try. Read more here: http://awickedscoff.blogspot.com/ About Me...The Wicked Newfoundlander I'm originally from Newfoundland, Canada, and very proud of it! I moved to upstate New York in 2007, and I spend much of my time working and playing throughout New England. Besides my wife, our dog and hockey, I'm passionate about food. I love to cook and create great tasting food. I also love tasting and critiquing food, and comparing regional cuisine (notably Newfoundland and New England dishes).